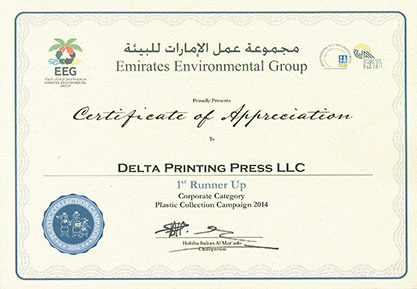 Delta Printing Press is committed to ongoing environmental monitoring and continual improvement, with a great emphasis on pollution prevention. Our core value of providing optimized solutions extends to resource optimization. Thus, our Environment Management Plan has been implemented to improve recycling rates, reduce energy and water consumption and adopt general efficiency measures. We believe that any green initiative, however small, will still influence in reducing our ecological footprint. Some of our initiatives include: Environment Action Group: This dedicated action group ensures adherence to environmental standards as required by ISO, schedules periodic waste audits and conducts staff awareness and training sessions. Reduction Measures: This comprises of initiatives to reduce paper consumption and controlling paper wastage during production and extends to consumption of electricity and petrol. Segregation Measures: Measures have been implemented to identify wastes for recycling and safe disposal of hazardous chemical waste and e-waste. Press Room Initiatives: Reducing the Isopropanol content of the fountain solution from 11% to a mere 2% is one of the key measures and an ongoing challenge. Minimizing plate wastage at CTP, increasing green cover in the production areas, switching over to hot glue and training staff in waste reduction techniques in cutting, binding and glue usage.